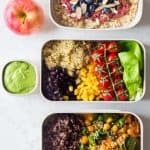 What is clean eating, how to make a 1-day clean eating meal plan, how to start a clean eating diet? This and delicious clean recipes all in one post. What is “clean eating” anyway? For lack of a better word, I call this the diet that I follow “clean eating” and this 1-day meal prep a “clean eating meal plan”. I don’t really like the term, however, it infers that it’s a diet when in reality it is not. The term makes people believe they have to make big changes and live with big restrictions to fit into this “diet”. When in reality it is rather a lifestyle that goes against the mainstream, against “as long as it’s quick and cheap I don’t care about the rest”. We ALL should care about the rest because our health depends on “the rest”. By eating clean you simply care for the rest, the consequences on your weight, your well-being and both your physical and mental health. So, get to the point Lorena, you might think. What the heck does clean really mean then? Gimme a definition. Exactly because of all of the things I mention above I have a problem with the term. There is no clear definition for “clean”. It can and should be defined differently for everybody. And it should be adapted to everyBODY. Yes, even within the members of the same family. In a clean eating family there is still room to accommodate to each individual family member’s metabolism and intestinal flora. MY clean eating diet is “inclusive” not “exclusive”. I feel almost all kinds of diets in recent time have their very convincing and important points. Things that I totally agree with: eating healthy fats (keto); eating enough protein that also provides easily digestible iron (paleo); eating a lot of vegetables (vegan). However, the one thing I don’t agree on at all with all these diets is the strong restrictions. “Don’t eat this, don’t eat that” on general grounds, because it’s “bad food”, not on individual grounds, because it makes you (specifically) feel uncomfortable or even sick. So, here an example, is gluten bad for you? According to some diets yes, according to others no. According to my clean eating definition: maybe, find out for yourself and then adjust your clean eating diet to your body and your metabolism and intestinal flora. Don’t eliminate gluten just because it’s supposed to be a “bad food”, eliminate it only if you notice for yourself, that gluten has a negative effect on your digestion and well-being. Is processed food the devil? In many diets processed food is labeled as the devil. While I agree that probably all highly processed food is most likely not good for us I still don’t label it as the devil. By labelling it, I already feel anxious about not getting even close to it and this relationship to any kind of food is probably not very healthy. While not ever getting close to them you might keep your body healthy, it could strongly screw with your mind though and that’s maybe even worse. And there is also the emphasis on highly. There will always be some sort of processing in our food today because the vast majority of us do not live on a farm where we can plant, grow and harvest our own fruits and vegetables or raise our own animal protein or grind our own flour etc. It’s OK to rely on a certain amount of processing. In this case “processed food” is not a curse but a blessing! It’s the highly processed that tips everything over the border. So, is “highly processed food” the devil? No, nobody is the devil. The devil doesn’t exist. But religion is not today’s topic, is it? If people invite me into their home to eat, I eat and I enjoy it and I am thankful for it. Most of all I am thankful for the social interaction, the hospitality, the fact that this person took time out of their day to think about offering me something to eat, to make me happy, because this is what I was invited for and what I came for in the first place. The same applies to healthy whole and clean food as it does to highly processed food offered by others. Nothing is the devil. Now, does this mean you should buy highly processed food to have on hand and eat in your own home? No. However, not because it is a restriction in this diet. Rather because there is no space left after you bought and ate all the things the diet includes. Green Healthy Cooking’s clean diet is omnivorous. Meaning you eat everything. You eat animal protein, you eat vegetables, you eat healthy fats, you eat grains and legumes, you eat dairy, YOU EAT anything your body thrives on being honest with yourself. This is the important message, being honest with yourself. You could say, but Lorena, my body thrives on candy bars and pancake mix. Does it really? Or, Lorena, everybody does poorly eating gluten, including me. Hand on your heart, do you really? And this is the thing, I’d say 99.9% of people’s bodies’ do not thrive on highly processed foods and rather on whole foods. Foods that you find on the outer perimeter of your grocery store in most cases, not the 20 isles in the middle ;) And a large percentage of people thrive on food containing the “prohibited” ingredients of many diets. Make sure to nourish your body and fulfil your macronutrient needs through whole foods. To make it very very simple: make sure half your plate is filled with fresh vegetables, every meal includes some sort of plant or animal protein, don’t worry about fat intake as long as it’s a natural fat and make sure you eat healthy carbohydrates. 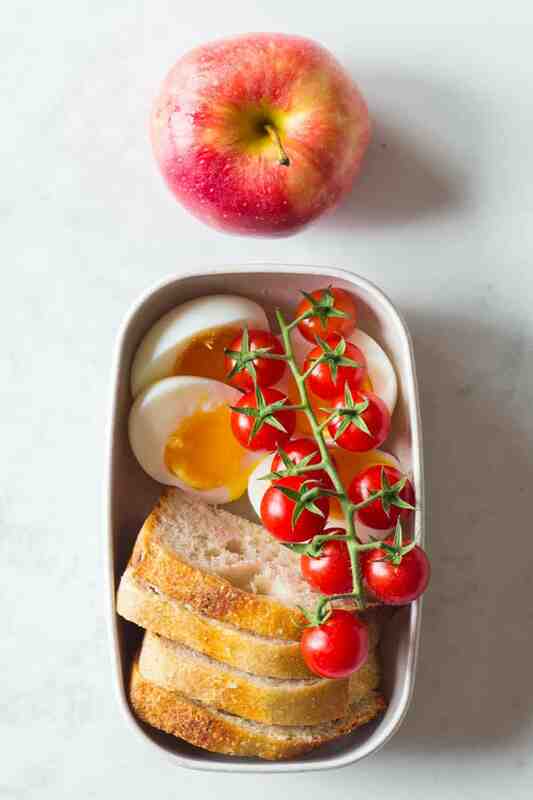 Clean Eating Breakfast for a Clean Eating Meal Plan – soft boiled eggs, buttered sourdough bread, cherry tomatoes and an apple. Now let’s get into the details of a Clean Eating Meal Plan that includes all the whole foods. Adjust according to your metabolism and well-being. You might thrive on a higher carb, lower carb, higher protein, lower protein or whatever diet. Add and reduce whatever makes you feel better but in general this 1-day meal plan written out in the recipe card below is a good place to start. Tell me, after a day like this, planned out and prepared. Do you think there would still be cravings for or hunger for a fast food restaurant’s menu? Do you think, that after eating all the things you see on these photos you’d still have space in your stomach for candy bars and pancake mix pancakes? And this is where I’m saying, that if you follow a clean eating diet, there simply isn’t room for unhealthy food. You don’t exclude them, there is no restriction. If someone offers you a store-bought cookie, you can happily accept it. You’ll eat it and be thankful for the person offering it to be so thoughtful. And also, you don’t feel like eating more because you just had your nutrient-dense lunch or dinner and simply won’t feel hungry enough to eat more. You “include” nutrient dense whole foods and that’s the only rule. If you eat your Clean Eating Meal Plan you prepared the day ahead, you won’t feel like eating much more. Your main focus is only on inclusion. I want to include as many healthy ingredients in my diet as possible and thus there is no room left for unhealthy non-clean food. 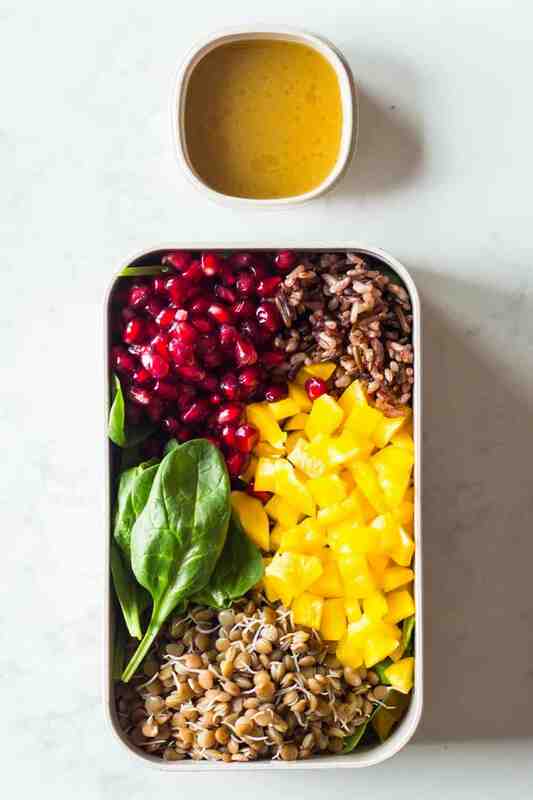 Clean Eating Lunch for a Clean Eating Meal Plan – baby spinach, cooked sprouted lentils, cooked wild rice blend, pomegranate seeds, chopped bell pepper with a homemade honey-mustard salad dressing. If you are currently on what many call a Standard American Diet full of highly processed foods containing large amounts of refined sugar and sodium, don’t start by excluding anything in your diet but rather by INCLUDING a lot of healthy whole foods. #1 Go to the grocery store and first fill your cart with all the things you want to include in your diet. All the things you know will nourish your body. Buy tons of vegetables, a lot of fruit, a reasonable amount of protein and healthy carbohydrates and then tell me how likely you are to top everything with the same amount of processed food you used to buy. You will most likely reduce the amount of processed food in your cart by 80% simply because your cart is already full. Some people like to plan day by day and include their cravings for certain foods or deals of the day in the store. Others like to plan out the whole week. Do whatever works best for you but plan at least the whole next day from breakfast to bed-time. Buy all the things your clean eating meal plan calls for and only then when you have all of it in your cart and if you can’t help it go down the junk food isle. #3 choose easy recipes that don’t take longer than 30 minutes to prepare at first. Later when you’re a pro you can include complicated, extraordinary tasting recipes. Cook ahead! Have your meals ready to eat or half prepped, ready to cook. 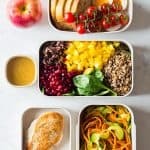 How likely do you think you are to go to a fast food restaurant or grab a microwave dinner if you could have your delicious planned out dinner instead? If you have things ready to grab, believe me, you will eat them, both the healthy and the unhealthy. Aim for only having healthy stuff ready to grab instead of unhealthy stuff and you’ll automatically improve your diet. And now I wrote a novel and you were ready to start cooking like after the second paragraph, am I right? 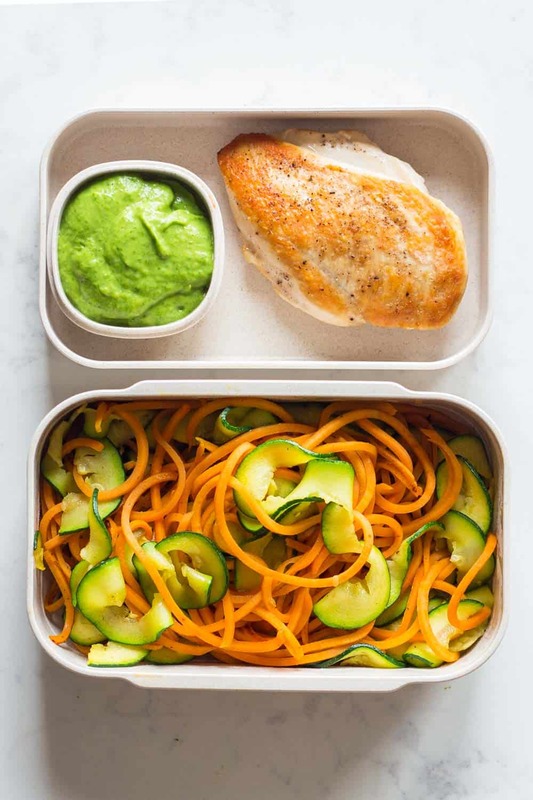 Clean Eating Dinner for a Clean Eating Meal Plan – pan-fried chicken breast, stir-fried spiralized sweet potato and zucchini with an avocado cilantro dressing. 2 slices sourdough bread homemade or from a good quality bakery that uses only flour, water and yeast for their bread, no preservatives. Breakfast: In a small sauce pan bring 2-3 cups of water to the boil. Cook a large egg in rolling boil for 5 minutes, then transfer to ice bath (a bowl with cold water and ice cubes in it). Wash cherry tomatoes and spread butter on bread. Lunch: Cook wild rice blend as instructed on packaging (cook a couple cups ahead to save for other days) or cook for 22 minutes on high pressure in the Instant Pot. Cook sprouted lentils for 8-10 minutes in boiling water, then strain. 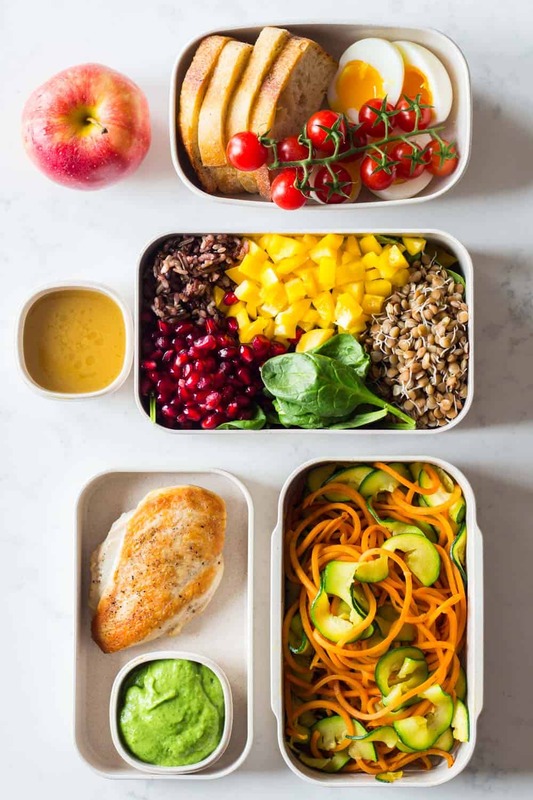 Add washed and dried baby spinach, chopped up bell pepper, cooked sprouted lentils, cooked wild rice blend and pomegranate seeds to a bowl or container. Add 1 Tbsp avocado oil, lime juice, sesame seed oil, mustard and honey in a small sealable container and shake (<- this is your clean salad dressing). Pour salad dressing over salad minutes before eating. Dinner: preheat skillet over medium heat. In a blender mix avocado, cilantro, jalapeño, lime juice, sea salt and pepper until smooth (<- this is your veggies dressing). Salt and pepper chicken breast and once skillet is hot add a splash of avocado oil and then chicken breast. Pan-fry chicken breast for 6-8 minutes per side or until it reaches an internal temperature of 165 F (73 C). Remove chicken from pan, add another splash of oil and spiralized sweet potato and zucchini and stir-fry for about 2-3 minutes. (I bought my veggies ready spiralized but you can spiralize yourself, too of course). Add avocado dressing to vegetables minutes before eating. If you need to store the dressing for several hours do so in an completely airtight container in the fridge. Thank you for all the information and being very honest about making a positive change. I am just starting out and would love guidance. I’m so happy you found the post and meal plan useful Janice :) You can check out my 21-Day Meal Plans (linked in the menu of my blog) there is tons of information there on clean eating. I have been researching what minerals and vitamins our bodies need, which ones come from which foods, which way they’re more readily absorbed, which foods seem to be most dense in these vitamins and minerals, and I have to say that I am shocked people would take meat out of their diet. Any place that I look, most of the most highly absorbable and dense vitamins and minerals are found in animal products, particularly the organs. I tried calf liver for the first time (because it would blow you away to know how healthy it is) and I am sorry to say that I couldn’t eat it even if I was dying and needed the nutrition right away. Though I was thinking of trying a pate for it, because I am desperate to have something that healthy in our diets. I wanted to know what was fat soluble so I could know I didn’t need to eat those foods all the time and what was water soluble so I’d know to eat those foods more often. I still have a lot of research to do, but I am fairly certain that animal products will always be a big part of our diet for healthy eating. While I don’t disagree that vegetables aren’t bad for you, all research seems to suggest that our bodies don’t absorb so much of the nutrition that is present in them. For instance, plant based vitamin A absorbs at a rate of 3% from beta carotene. I’ve read that even 45% of people cannot even convert it at all. So they can’t get any vitamin A from plants. Even vegans with this mutation (that doesn’t allow beta carotene conversion to retinol) had to switch an animal supplement like fermented cod liver oil to get adequate amounts of vitamin A. So I don’t have as much faith in vegetables as some seem to have. Sure, there’s not anything wrong with vegetables (aside from the fact they could have harmful pesticides), but they seem so empty to me when one considers how little it seems our bodies can absorb of them. Hi Lorena! Thanks for posting all of your delicious recipes. Do you have any suggestions for replacing Avocado/Avocado oil, with an alternative for your dressings, etc…? I have an allergy to them…sadly!!! Hi Sheri, any oil will do for the dressing. I prefer avocado because it’s so tasteless but sunflower seed oil is pretty taste-less, too. If you like olive oil in your dressing you can also use olive oil. How much do the ingredients for this menu plan for a day cost? Can you please also post that information? Woah, there is so much great information in this post, thank you! Also, this meal plan looks so filling and nutritious!